Objectives: The objective of this study was to determine the prevalence of upper renal tract obstructive changes in women with uterine fibroids using ultrasonography (USG). Methods: We enrolled 140 women with uterine fibroids and performed USG of the uterus and upper renal tract with full and empty urinary bladders, respectively. 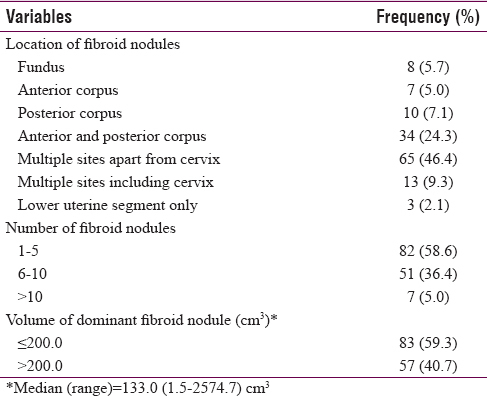 The number of fibroid nodules and the uterine volume were determined. The presence of hydronephrosis was graded and documented. Uterine volumes >200 cm3 were denoted as large and vice versa. Statistical analysis was done using Chi-square and non-parametric tests. Results: The median uterine volume was 556 cm3. Application of a 200 cm3 cut-off value yielded 126 (90%) large uterine volumes and 14 (10%) small uterine volumes. Of the 140 women enrolled, 52 (37.1%) had renal backpressure changes. Of these 52 patients, 51 (98.1%) had uterine volumes >200 cm3. 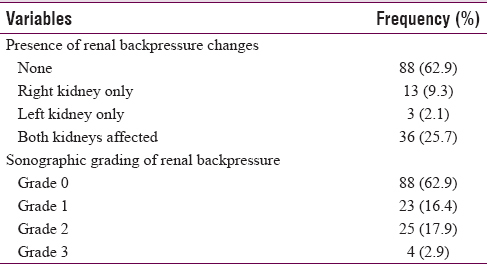 Both kidneys were affected in the vast majority (36 out of 52 = 69.2%) of those with renal backpressure changes, and 23 (44.2%) of the 52 women with renal backpressure changes had mild (Grade 1) hydronephrosis, while 25 (48.1%) had moderate (Grade 2) hydronephrosis. When unilateral, however, backpressure changes were significantly more common on the right side. Conclusion: Approximately one in three women with fibroids had renal backpressure changes in this study. Large uterine volume is a key predisposing factor. Routine sonographic assessment of fibroids should include a focused/targeted evaluation of the kidneys. Uterine leiomyomas/uterine fibroids are three to nine times more common and tend to be larger in women of African descent than women of other racial groups. It is often asymptomatic but may present with debilitating genitourinary signs including acute urinary retention, obstructive uropathy and haematuria. 'Obstructive uropathy refers to structural impedance to the flow of urine anywhere along the urinary tract leading to pelvicalyceal dilatation/hydronephrosis', which may progress to obstructive nephropathy if neglected. Hydronephrosis, which is a symptom of obstructive uropathy, refers to dilatation of the urinary collecting system (calyces, infundibula and pelvis) of the kidney. However, obstructive uropathy and hydronephrosis are not synonymous since pelvicalyceal dilatation can also occur in the absence of urinary obstruction. Obstructive uropathy could be congenital or acquired, acute or chronic, unilateral or bilateral, symptomatic or asymptomatic, episodic/intermittent or permanent. The upper urinary tract dilatation associated with uterine leiomyoma is usually chronic in nature. In a previous study of sixty patients with obstructive uropathy, twenty (33%) of them were secondary to uterine leiomyomas. Similarly, Soyebi and Awosanya reported that uterine fibroids (23 cases = 11.4%) were the most common cause of obstructive uropathy in their study of 202 patients. Although numerous researchers have reported on the epidemiology and management of uterine fibroids, very few have studied specifically the usually asymptomatic and sinister complication of obstructive nephropathy. Our aim was to evaluate the obstructive effect(s) of uterine fibroids on the upper urinary tract in our locality using ultrasonography (USG). This prospective descriptive cross-sectional study was done in the Department of Radiology of Obafemi Awolowo University Teaching Hospitals Complex, Ile-Ife, Osun State, Nigeria, from November 2013 to November 2014. The Ethics Committee of the hospital approved the study (Protocol Number: ERC/2013/09/13; Approval Date: 5th September, 2013). Documented informed consent was obtained from all the participants. One hundred and forty women who were sonographically diagnosed with uterine fibroids were enrolled consecutively. Exclusion criteria were congenital uterine anomalies, coexisting ovarian and pelvic mass(es), pregnancy, polyuria, history of renal pathology or renal replacement therapy and renal masses/space-occupying lesion discovered on sonography. Model DC-7 Mindray® ultrasound machine (Shenzhen Mindray Bio-Medical Electronics, Nanshan, Shenzhen, China) with a 3.8–5.0 MHz transducer was utilised for the sonographic examinations which were performed by the first author. Each patient was positioned supine on the examination couch. Following adequate urinary bladder distension, the uterus was scanned in orthogonal planes. The uterine volume was determined using the prolate ellipse formula as follows: length (cm) × anteroposterior (cm) × transverse (cm) × 0.523. The length of the uterus was measured on midline sagittal image from the fundus to the external cervical os; its anteroposterior diameter was measured perpendicular to the length, while the transverse diameter was taken as the intercornual distance on a transverse image. Each measurement was taken three times to limit intraobserver error, and the average value was recorded. The uterine volumes were classified as large or small if they were greater or lesser than 200 cm3, respectively. The following were also documented: position/location of the fibroids within the uterus (fundus, anterior, posterior or lateral corpus, lower uterine segment and cervix), number of fibroid nodules and fibroid type (intramural, subserosal, submucosal, pedunculated or multiple sites). Submucosal fibroid was identified as ‘any leiomyoma in contact with or distorting the uterine cavity without identifiable myometrium between the leiomyoma and the endometrium’; subserosal fibroid as ‘a nodule distorting the external contour of the uterus with >50% of its volume protruding out of the uterine surface’; intramural fibroid as ‘a nodule that is completely within the myometrium, distorting neither contour nor cavity’ and a pedunculated fibroid as ‘a nodule that is attached to the uterus with an identifiable stalk’. The participants were instructed to empty their urinary bladder and then placed in the prone position to assess the kidneys. This was done for optimal visualisation of the kidneys and to prevent false-positive distension of the calyces. The kidneys were examined for sonographic evidence of backpressure changes/hydronephrosis. If backpressure changes were noted, they were graded using the sonographic grading for hydronephrosis as reported by Ellenbogen et al: ‘Grade 0 = central collecting system echo is compact (closely apposed) and homogeneous; Grade 1 = slight separation of the renal collecting system echoes with a central ovoid or fusiform sonolucency; Grade 2 = further separation of the collecting system echoes with a rounded sonolucency seen centrally; Grade 3 = renal pelvis is dilated and there are fluid-filled calyces throughout the kidneys/major portion of the kidney is replaced by a sonolucent sac and Grade 4 is the same as Grade 3, but the renal parenchyma over the calyces is thinned’ [Figure 1]a, [Figure 1]b, [Figure 1]c, [Figure 1]d. The right and left ureters were looked for and, when visualised, the diameter of each was taken and graded as below: Grade 0: non-visualised or ureter calibre ≤3 mm; Grade 1: ureter calibre between 4 and 6 mm; Grade 2: ureter calibre between 7 and 9 mm and Grade 3: ureter calibre >10 mm. The uterine volume data of the 140 patients have been re-used with permission., Sample size was calculated using a leiomyoma prevalence of 9.3% in the Fisher formula. The Statistical Package for the Social Sciences (SPSS) software version 20 for Windows (SPSS Inc., Chicago, IL, USA) was used for data analysis. Mann–Whitney U-test, Kruskal–Wallis test, Chi-square test and Spearman's rank correlational analysis were used as appropriate. Statistical significance was set at P ≤ 0.05. The mean age of the participants was 37.9 ± 7.4 years (range = 23–57 years). The 30–39 years' age range had the highest occurrence of uterine leiomyoma, while the ≥50 years' age range had the least. The mean parity was 1.67 ± 1.14. The median uterine volume was 556 cm3 (range = 37–9384 cm3; mean = 1032 ± 1259 cm3). The cut-off value of 200 cm3 yielded 126 (90%) large uterine volumes and 14 (10%) small uterine volumes. The dominant leiomyoma nodule had a median volume of 133 cm3 (range = 1.5–2575 cm3; mean = 354 cm3 ± 491 cm3). The dominant leiomyoma nodule volume was ≤200.0 cm3 in 83 (59.3%) women but >200.0 cm3 in 57 (40.7%) women. The mean number of leiomyoma nodules per woman was 5.1 ± 3.3 (range = 1–14). Twenty-five women (17.9%) had solitary leiomyoma nodule, while 115 (82.1%) had multiple (two or more) leiomyoma nodules. Further subgrouping of the number of leiomyoma nodules is illustrated in [Table 1]. The total number of leiomyoma nodules in all the women was 715. Uterine volume showed a weak positive correlation with the number of leiomyoma nodules (Spearman's rho = 0.4; P < 0.0001). The locations of the fibroid nodules are shown in [Table 1], while the distribution of renal backpressure changes is shown in [Table 2]. Of the total study population of 140 women, 52 (37.1%) had renal backpressure changes – all were asymptomatic. Of these 52 patients, 51 (98.1%) had uterine volumes >200 cm3. Both kidneys were affected in most (36 of 52 = 69.2%) of those with renal backpressure changes. Twenty-three (44.2%) of the 52 women with renal backpressure changes had mild (Grade 1) hydronephrosis, while 25 (48.1%) had moderate (Grade 2) hydronephrosis [Table 2]. Of the 126 participants with uterine volume >200 cm3, 51 (40.5%) had renal backpressure changes, while only one woman (7.1%) with uterine volume ≤200.0 cm3 had renal backpressure changes; P = 0.01 [Table 3]. Of the 82 women with ≤5 fibroid nodules, renal backpressure changes were seen in only 23 (28%) compared to the occurrence of renal backpressure changes in 29 (50%) out of 58 women with ≥5 fibroid nodules; P = 0.01. No relationship/association was demonstrated between fibroid location and presence/absence of renal backpressure changes. [Table 4] juxtaposes our findings with those of previous studies. Leiomyomas have a profound impact on the reproductive history of women., Indeed, their presence in a woman is predictive of future major uterine surgical procedures. There is a large body of literature on leiomyoma epidemiology, symptomatology, investigation and treatment,,, but studies on the effects of fibroids on the urinary tract are fewer. The prevalence of obstructive uropathy in this study was 37.1% (approximately one in every three patients with uterine fibroids) which is higher than the prevalence (3.7%–14.4%) reported by other researchers.,,, This disparity is likely due to differences in uterine volume and/or dominant leiomyoma volume of the various studies. For example, the mean volume of the dominant fibroid in this study (354 cm3) is much higher than 233 cm3 reported by Alyeshmerni et al. The study results as reported by the other researchers precluded meaningful direct comparison (some reported mean diameter but not the volume of the dominant fibroid nodule and/or expressed uterine size as clinical weeks rather than volume).,, However, the overall pattern of findings in all these studies (including ours) is similar; patients with hydronephrosis had significantly larger uterine volumes than those without., In addition, we observed that renal backpressure changes were more likely with increasing number of fibroid nodules, which tends to increase the uterine volume. The vast majority of patients (62.9% of the total sample size) in this study group did not have obstructive uropathy. Among those with obstructive uropathy (37.1% of the total sample size), Grade 2 obstruction was the most common pattern (48.1%) followed by Grade 1 (44.2%) and Grade 3 obstruction (7.7%). In agreement with previous reports,,, unilateral right hydronephrosis (9.3%) was more common than unilateral left hydronephrosis (2.1%). This observation is said to be due to the protective effect of the sigmoid colon on the left ureter. Imaging is crucial in the evaluation of suspected fibroid-associated urinary tract obstruction., The gynaecologist and urologist may be interested in getting answers to the following questions: ‘What is causing the obstruction? What is the size of the obstructing “something”? At what level is the obstruction? What is the diameter, the position and the tortuosity of the ureter above and below the obstruction? Is there any clue for how long the obstruction has been present, for example, from the degree of dilatation of the upper urinary tract? and given the information derived from the imaging, how best should the patient be managed’? In patients with uterine fibroids, some of these questions could be answered reasonably with USG: cause of obstruction, size of the obstructing lesion, and visualising that there had been dilatation for a while (based on the degree of calyceal dilatation, renal cortical thinning and ureteral dilatation). Urinary tract obstruction by uterine leiomyomata is not uncommon though most cases appear to be mild or moderate in severity. Women with large fibroid masses and large uterine volumes are at a higher risk. Patients with fibroids should have routine ultrasound scan of their kidneys/ureters to detect this condition promptly since it is often asymptomatic. USG should be the first line of investigation, rather than subjecting all patients with uterine fibroids to IVU, for identifying urinary tract involvement. Faerstein E, Szklo M, Rosenshein N. Risk factors for uterine leiomyoma: A practice-based case-control study. I. African-American heritage, reproductive history, body size, and smoking. Am J Epidemiol 2001;153:1-10. Dagur G, Suh Y, Warren K, Singh N, Fitzgerald J, Khan SA, et al. Urological complications of uterine leiomyoma: A review of literature. Int Urol Nephrol 2016;48:941-8. Walsh PC, Retnik AB, Vaughan ED, Wein AJ. Pathophysiology of urinary tract obstruction. In: Campbell's Urology. 7th ed. Philadelphia: W.B. Saunders Company; 1998. p. 343-60. Klahr S. Obstructive nephropathy. Intern Med 2000;39:355-61. Robins SA, Fischmann J. Hydronephrosis; a radiologic classification based on anatomical variations. Radiology 1948;50:632-8. O'Reilly PH. Role of modern radiological investigations in obstructive uropathy. Br Med J (Clin Res Ed) 1982;284:1847-51. Apoku IN, Ayoola OO, Salako AA, Idowu BM. Ultrasound evaluation of obstructive uropathy and its hemodynamic responses in Southwest Nigeria. Int Braz J Urol 2015;41:556-61. Soyebi KO, Awosanya GO. Causes of obstructive uropathy at the Lagos university teaching hospital, Lagos, Nigeria. Niger Q J Hosp Med 1996;6:173-7. Alataş G, Aksoy E, Akarsu C, Yakin K, Bahçeci M. The effect of uterine volume on uterine artery Doppler velocimetry in the leiomyomatous state. Gynecol Obstet Invest1997;43:55-9. Mavrelos D, Ben-Nagi J, Holland T, Hoo W, Naftalin J, Jurkovic D, et al. The natural history of fibroids. Ultrasound Obstet Gynecol 2010;35:238-42. Ellenbogen PH, Scheible FW, Talner LB, Leopold GR. Sensitivity of gray scale ultrasound in detecting urinary tract obstruction. AJR Am J Roentgenol 1978;130:731-3. Idowu BM, Ibitoye BO, Adetiloye VA. Uterine artery Doppler velocimetry of uterine leiomyomas in Nigerian women. Rev Bras Ginecol Obstet 2017;39:464-70. Idowu BM, Ibitoye BO. Doppler sonography of perifibroid and intrafibroid arteries of uterine leiomyomas. Obstet Gynecol Sci 2018;61:395-403. Niang L, Winn T, Rush BN. Practical issues in calculating the sample size for prevalence studies. Arch Orofacial Sci2006;1:9-14. Okogbo FO, Ezechi OC, Loto OM, Ezeobi PM. Uterine leiomyomata in south western Nigeria: A clinical study of presentations and management outcome. Afr Health Sci 2011;11:271-8. Obi-Egbedi-Ejakpovi EB, Akhigbe OT, Irabor PF. 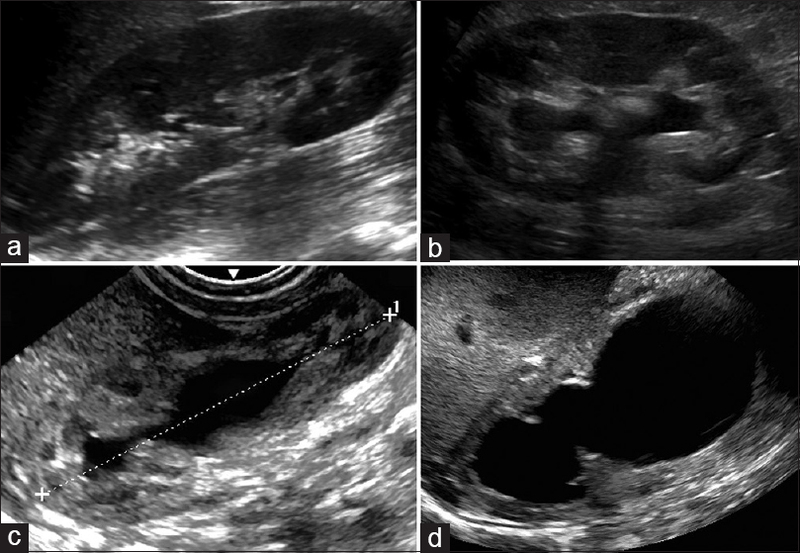 Evaluation of women diagnosed with uterine fibroid in Irrua using B-mode ultrasonography. West Afr J Ultrasound 2017;18:43-8. Alyeshmerni D, Banovac F, Pehlivanova M, McCullough M, Hansford B, Spies J, et al. Resolution of hydronephrosis after uterine artery embolization for fibroids. J Vasc Interv Radiol 2011;22:865-9. Fletcher HM, Wharfe G, Williams NP, Gordon-Strachan G, Johnson P. Renal impairment as a complication of uterine fibroids: A retrospective hospital-based study. J Obstet Gynaecol 2013;33:394-8. Bostofte E, Larsen T, Torp-Pedersen S, Ottesen M. Preoperative investigations for suspected pelvic masses. Eur J Obstet Gynecol Reprod Biol 1992;47:239-43. Baird DD, Saldana TM, Shore DL, Hill MC, Schectman JM. A single baseline ultrasound assessment of fibroid presence and size is strongly predictive of future uterine procedure: 8-year follow-up of randomly sampled premenopausal women aged 35-49 years. Hum Reprod 2015;30:2936-44. Donnez J, Dolmans MM. Uterine fibroid management: From the present to the future. Hum Reprod Update 2016;22:665-86. Mirsadraee S, Tuite D, Nicholson A. Uterine artery embolization for ureteric obstruction secondary to fibroids. Cardiovasc Intervent Radiol 2008;31:1094-9. Bansal T, Mehrotra P, Jayasena D, Okolo S, Yoong W, Govind A, et al. Obstructive nephropathy and chronic kidney disease secondary to uterine leiomyomas. Arch Gynecol Obstet 2009;279:785-8. Selfer J, Brenner B. Urinary tract obstruction. In: Braunwald E, Fauci A, Kasper D, Hauser S, Longo D, Jameson L, editors. Harrison's Principles of Internal Medicine. 15th ed. New York: McGraw-Hill; 2001. p. 1627-9. Jones RM, Marshall CA. Influence of coexisting disease. In: Kirk RM, Ribbans WJ, editors. Clinical Surgery in General. 4th ed. London: Elsevier; 2004. p. 75-6. Brenner BM. Nephron adaptation to renal injury or ablation. Am J Physiol 1985;249:F324-37. Brenner R, Brenner B. Disturbances in renal function. In: Braunwald E, Fauci A, Kasper D, Hauser S, Longo D, Jameson L, editors. Harrison's Principles of Internal Medicine. 15th ed. New York: McGraw-Hill; 2001. p. 1535-40. Szopiński T, Keller E, Záťura F. Kidney ultrasound – What is important for a urologist? J Ultrason 2016;16:371-7. Whitfield AH, Whitfield HN. Is there a role for the intravenous urogram in the 21st century? Ann R Coll Surg Engl 2006;88:62-5. Webb JA. Ultrasonography and Doppler studies in the diagnosis of renal obstruction. BJU Int 2000;86 Suppl 1:25-32. Simel DL, Matchar DB, Piscitelli JT. Routine intravenous pyelogram before hysterectomy in cases of benign disease possibly elective, definitely expensive. Am J Obstet Gynecol 1988;159:1049-53. Dalla-Palma L, Bazzocchi M, Pozzi-Mucelli RS, Stacul F, Rossi M, Agostini R, et al. Ultrasonography in the diagnosis of hydronephrosis in patients with normal renal function. Urol Radiol 1983;5:221-6. Common uses of intravenous pyelography in adults. American College of Physicians. Ann Intern Med 1989;111:83-4. Piscitelli JT, Simel DL, Addison WA. Who should have intravenous pyelograms before hysterectomy for benign disease? Obstet Gynecol 1987;69:541-5. Simel DL, Piscitelli J, Matchar DB. Intravenous pyelography before hysterectomy. Ann Intern Med 1989;111:541. Mushlin AI, Thornbury JR. Intravenous pyelography: The case against its routine use. Ann Intern Med 1989;111:58-70. Sack RA. The value of intravenous urography prior to abdominal hysterectomy for gynecologic disease. Am J Obstet Gynecol 1979;134:208-12. Little MA, Stafford Johnson DB, O'Callaghan JP, Walshe JJ. The diagnostic yield of intravenous urography. Nephrol Dial Transplant 2000;15:200-4. Aregbeshola BS. Out-of-pocket payments in Nigeria. Lancet 2016;387:2506. Bateman GA, Cuganesan R. Renal vein Doppler sonography of obstructive uropathy. AJR Am J Roentgenol 2002;178:921-5.